So I'm fairly new to the forums and fairly new to airsoft but not new to guns persae, so I wanted my first rifle to be edging on the realistic side so I went for the GHK. 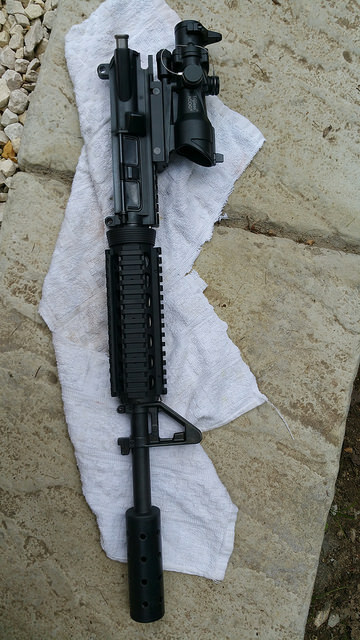 I bought it in a good but used condition with some scratches to the lower receiver which I can't live with so I thought it would be a good introduction and learning curve to take it apart. So I did, right down to every last roll pin and circlip. What follows is a brief account of the primary stages of development. The final pictures of 100% completion should follow in a day or two. Firstly this was how NOT to try and strip the anodising from the aluminium parts. I'd read about oven cleaner, drain cleaner, caustic soda etc etc, some of which I tried (yes it's dodgy) but at the end of the day you're never going to get into all the little cracks and slots to eradicate all the old colouring so this was quickly aborted. This is how the parts looked after I'd taken them to Dan at Gritblaster near Norwich for a proper job. He done these for me and had them back in less than 2 days and a damn nice bloke to boot. 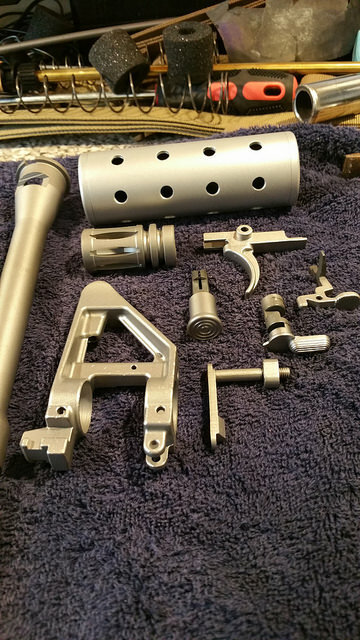 If you're looking for grit blasting, bead blasting etc then you'd do a lot worse. Anyway.. as you can see from these images everything's nice and clean, degreased (several times) with washing up liquid, then Birchwood Casey Degreaser for good measure. 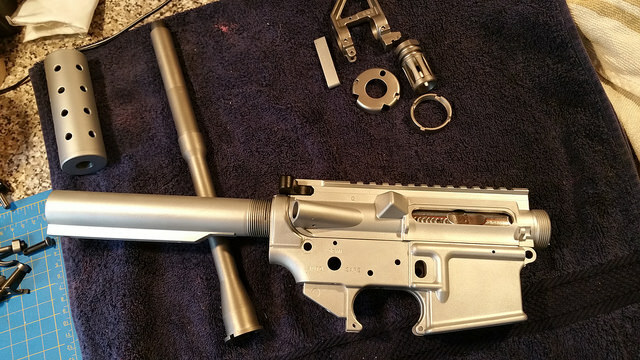 Also you'll note the Cyma stubby silencer which I didn't like stock, so I filled it full of holes and gave it the same treatment, with the idea of it matching the final finish. 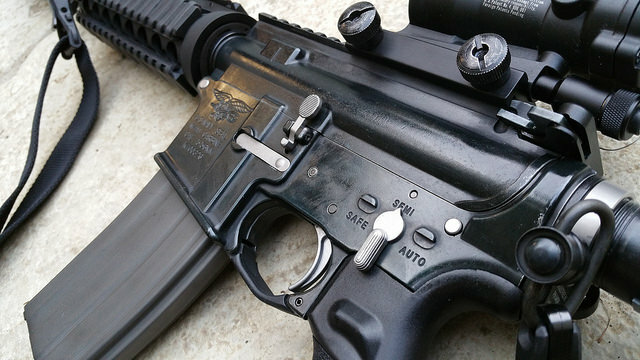 At this point I really liked the idea of leaving the trigger, fwd assist, mag release etc all bare steel. The contrast against a black body would look awesome, that's exactly what I did. In the meantime as you'll see in the image above, I decided to give the bolt the Autosol treatment as a bit of an afterthought. Turned out well, looks nice against the black receiver. So, with the parts cleaned i whipped out the Birchwood Casey Aluminium Black for the upper, lower and buffer tube. This stuff's a bit of thing to get your head round when you apply it. You can read all the books and watch all the vids on it but when you apply it somehow it just doesn't behave how you expect. It seems like rubbing it in circular motions over the area actually make it infuse into the metal surface better. No doubt different folks will all have their own take on it. 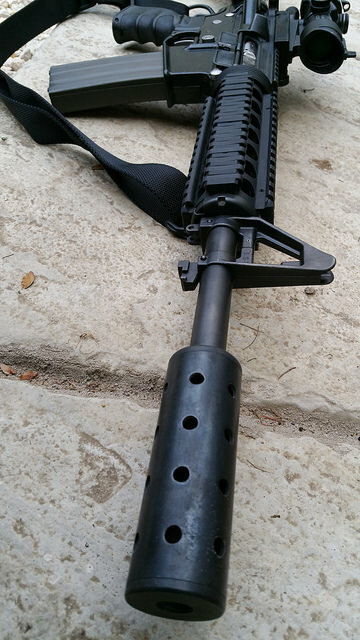 So below is the lower and buffer tube done with my D-Boys Mod crane stock from Bullseye Country Sport fitted that I was hell bent on getting (as per a discussion on a previous post, yes it did fit like a charm thanks proffrink ). I love the look of it, also just visible is the Troy style dual QD rear sling mount from Davescustomairsoft which is also great quality. I love the look of the steel parts against the black. 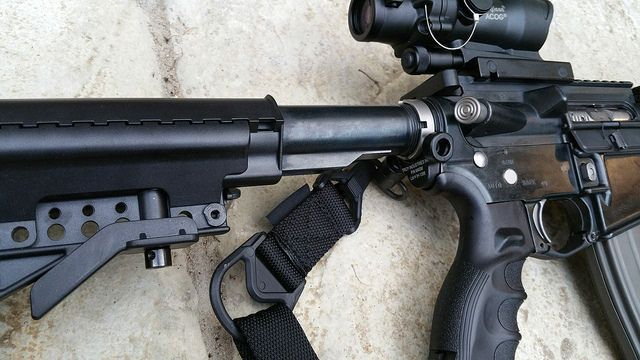 Here's one of the barrel and silencer looking nicely matched as planned. The barrel was done with Birchwood Casey liquid blue. 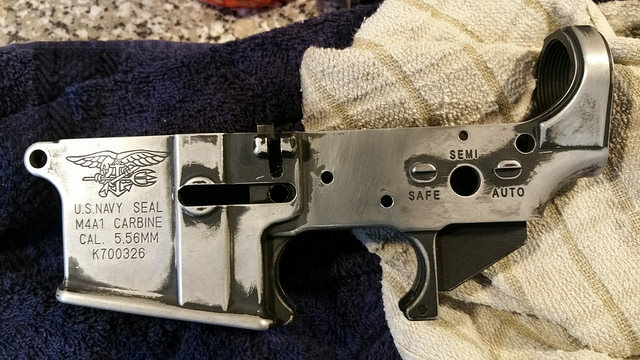 It gives the whole gun that real steel finish that anodising or paint just don't. Aside from that it's a lot easier to touch up if you scrape it or mark it in any way. Just re-black, wash n' go. 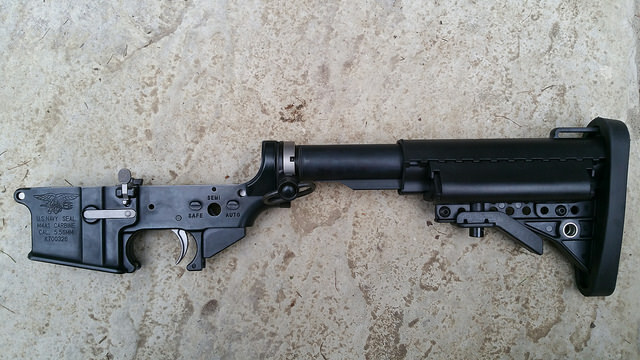 And finally a shot of the reassembled upper with acog attached. 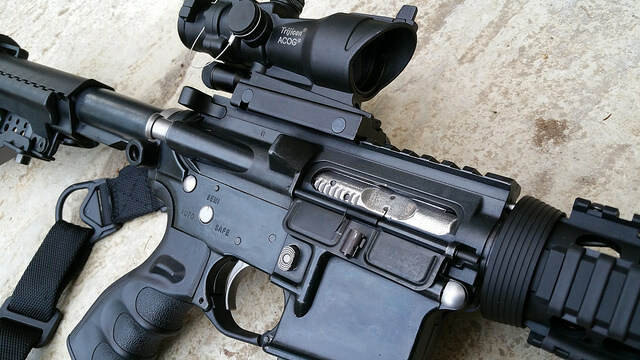 At this point I'll mention that apart from the replacement Prometheus bucking and nub, Vipertech spring, FG-Airsoft adjustable nozzle and heavy buffer, there are no aftermarket 'performance parts' fitted. 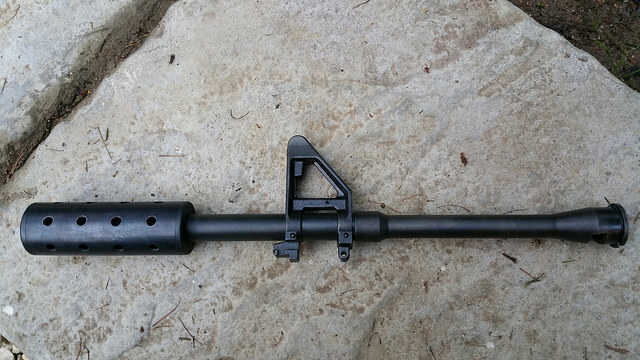 I plan to fit an aftermarket inner barrel later but I want to evaluate it's performance pretty much stock first, so i can see what if any improvements are made. 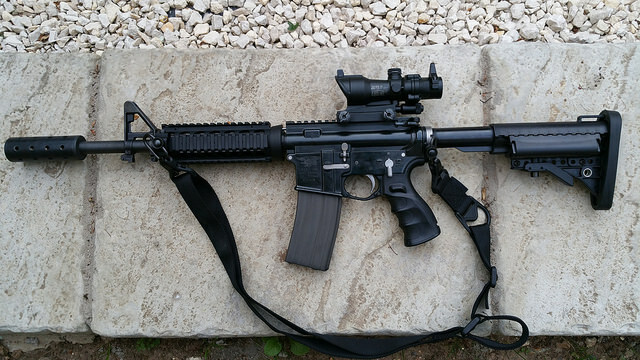 I've certainly learned a lot from this project, which was the whole idea and feel quite conversant now with the inner workings of an M4 GBBR. I must also give a big shout out to nugentgl on You Tube for his excellent 'how to' series on this and many more airsoft weapons. If you're not familiar I seriously recommend a visit. More pictures of the finished weapon in a day or two. OK So here are half a dozen shots of the finished article, thanks for the likes, guys. Blimey looks sweet mate good work. Guns: None as if yet. Loadouts: None as of yet. Very imformative. Especially for noobs like myself. So lets see some more.